DETROIT -- UAW-represented workers at Fiat Chrysler Automobiles approved a new four-year agreement with the carmaker after negotiators revised a rejected, earlier deal that failed to provide a pathway for entry-level Tier 2 workers to achieve full pay. The final count was 77 percent in favor, the union said in a statement today following two days of voting. Production workers approved it with 77 percent of the vote while skilled trades gave it 72 percent and the salaried bargaining unit voted 87 percent. “The recent bargaining process that took place on behalf of our members at FCA is a testament to the UAW’s democratic values and commitment to our members," UAW President Dennis Williams said in a statement today. The company said in a statement: "This agreement represents an investment in our U.S. workforce and recognizes its contributions to the Company’s growth over the past six years. With the bargaining process now complete, the Company and our employees can look forward to continuing to build world class products, investing in our operations and achieving the targets set out in our five year business plan." The new contract eliminates the divisive Tier-2 wage by providing entry-level workers with an eight-year ladder of pre-determined annual raises until they reach full wages of $30 an hour. It is similar to a 10-year grow-in to full wages that the Detroit 3 have had since 2012 in Canada, where their entry-level auto workers are represented by the Unifor union. 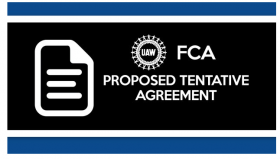 The contract also contains a detailed plan for future product production unlike the initial agreement between FCA and the UAW that the rank-and-file rejected this month by nearly a 2 to 1 margin. With the FCA contract done, the UAW can now move on to either General Motors or Ford Motor Co. to bargain contracts that are expected to be very similar to the FCA deal, said Kristin Dziczek, director of the labor and industry group at the Center for Automotive Research in Ann Arbor, Mich.
“It’s a good deal that was communicated better this time than last,” Dziczek said. At Local 685 in Kokomo, Ind., the largest FCA local, nearly 90 percent of production workers approved the pact after turning down the initial offer. One of the closer votes was at FCA’s Toledo Assembly Complex, where 55 percent of voting members approved the deal. Local 12 President Bruce Baumhower said workers at the Toledo factory are still “uneasy” about the security of their jobs after learning of FCA’s decision to move production of the Jeep Cherokee to Belvidere, Ill. The automaker plans to expand Jeep Wrangler production in Toledo in 2017 by moving the iconic off-roader into the portion of the plant now building the Cherokee and building a Wrangler-based pickup in the portion now building the Wrangler. The contract contains assurances for workers in Toledo that the moves would not result in lost employment in the plant. FCA workers voted on the contract on Tuesday and Wednesday. UAW leadership allowed 11 days between the ratification vote and the revised agreement being announced Oct. 8 to give workers plenty of time to ask questions and review the deal. Dziczek said the UAW’s failure to explain the first contract and swat down rumors and misinformation on social media contributed to the defeat of the first agreement. The absence of a pathway to top pay was the main reason FCA's 40,000 hourly workers voted down the previous tentative deal last month and were poised to strike FCA at a potential cost of $1 billion a week in revenue from lost vehicle production. That previous deal offered Tier 2 workers substantial raises over four years that would have taken maximum pay from $19 an hour to $25 an hour. But it fell $5 an hour short of the full pay that Tier 1 workers achieve at contract's end. About 45 percent of FCA's hourly work force is Tier 2. Faced with the prospect of a strike, FCA opted for the improvements on Tier 2 in part because the additional new costs above the previous deal are back-loaded. Most of those costs don't kick in for five years, or until after this year's contract would expire four years from now. Dziczek said the approved contract won’t raise FCA costs over the four years hardly more than the earlier contract they rejected. It does have something for everyone, though. Legacy workers received a 3 percent wage increase in year’s one and three of the contract, with lump-sum bonuses of $2,400 and $2,500, respectively, in year’s two and four. The revised agreement also raised the contract signing bonus for Tier 1 workers by $1,000 to $4,000 from $3,000, while leaving the signing bonus for entry-level workers at $3,000. Additionally, FCA and the UAW agreed to consider changes to alternative work schedules that can cause workers to change shifts between days and nights. The union also scrapped plans for a health care co-op that workers thought might raise their out-of-pocket costs from one of the richest plans in industrial America. Instead, health care will continue to be paid by FCA with workers contributing just 6 percent of the cost vs. about 30 percent for FCA salaried workers. Following the FCA vote, the UAW could focus on either FM or Ford as its next “target,” or may try to finish both simultaneously. Negotiations with both Ford and GM have been ongoing, albeit quietly, while FCA and the UAW secured their deal.